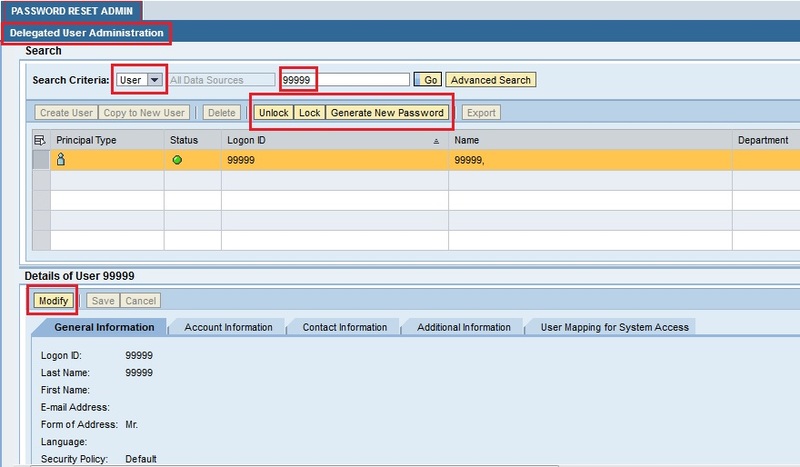 Is there any way to allow only unlock/reset password access on Enterprise Portal? We don't want to assign the admin role as it would give too much access. want to restrict it?? How to make only password reset available in user admin ? If you want to give the Password reset / unlock Administration to End User (Admin). Where the help desk team/ end user admin can reset/unlock a portal user. This can be achieved by giving him User Administration Role (Which comes as web based tool in EP). But User administration contains a lot of functionality other that user password reset / unlock. For USER ADMINISTRATION functionality click here. So if you want to provide/restrict the user to only password reset / unlock in user admin just follow the below post. Assign the Workset Delegated User admin to the role. Portal Content > Content provided by SAP > Admin content > User administrators > Workset > Delegated User admin. Now go to User Admin. Select role. and search for the role created and select it and click on Modify. Now add the Manage_User_Passwords action to it. With this action a user can manage the passwords of users belonging to his or her company. The user with this action can view the user profiles of other users in his or her company and even lock and unlock their accounts. Use this action to create a delegated password administrator. Now create the User for whom you want to give this access and assign the role created to him. Finally Role looks like below, only unlock/lock/password reset are enabled.